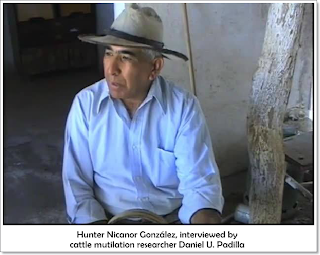 Argentinean cattle mutilation researcher Daniel Ubaldo Padilla posted this interview with a cattleman and hunter as part of his ongoing investigations into his country's mutilation phenomenon. "The idea of this interview," he writes, "is to disabuse the notion of the puma as the apex regional predator. Pumas did not attack the animal appearing in the photographs [at the start of the video]. Nor are pumas still causing mutilations in La Rioja. Over the years, these strange depredations (mutilations) could have been camouflaged by successive deaths, with the blame for all of these deaths and mutilations being laid upon the puma." Daniel Padilla: Well, we're here with Nicanor Gonzalez, who is going to tell us a little about...his hunting experience, shall we say, gained by being a disciple of his father in law, Teodoro Vizuela, who was a great hunter. He will be telling us a bit about puma hunting. Here we have a puma trap and a cured puma hide, so, Don Vizuela, please -- I mean, Don Nicanor Gonzalez, sorry -- thank you so much for the attention you've given us, and for welcoming us into your home after journeying so many kilometers. Daniel Padilla: I would like to ask you some questions about the animals that attack cattle in these regions. How did you learn to hunt pumas? set the trap, and by the following night, the predator will return. Sometimes it escapes. You can also set the traps wherever it goes to pee or defecate. It'll return in a few days, maybe fifteen days, twenty days or [you can set the trap] in the water, like in that reservoir where they come to drink. Because in these parts we don't have watering holes, like they're called elsewhere. All we have is the reservoir. Daniel Padilla: Here in this area you're the only one who has this setup? Nicanor Gonzalez: Yes, there are others, but at times when there is no rain, like October or November, there's very little water left. If it's very hot, the critters are forced to come and drink. Due to the heat, they have to find water. Daniel Padilla: Pumas, generally speaking, during these large hunts of over a hundred pumas like the ones your father-in-law hunted, the animals still presented a problem to cattle at the time, and still do. Nicanor Gonzalez: Yes. [A problem] to goats. He had many goats, and [the pumas] would kill them. One, two, three, four...many. And that's what he did. He trapped them over a year or two, keeping track, logging them down. Daniel Padilla: Could you see how a puma attacks, let's say a bovine. What's the predatory action of the puma? Nicanor Gonzalez: Yes, I've seen them attacking little colts and small mules. Like I was telling you the other day, it attacks them from behind, grabs them by both legs, jumps on their backs, claws them on either side. Terrible. Then it exhausts the animal, causing it to run until it catches it. Then it jumps on their necks and stabs [the animal] with its hunting claws. Nicanor Gonzalez: Yes, well, when the animal is a large one. Otherwise, when it's small like a goat or a kid, no, it just waits it around like a toy. It drags them, covers them up well, to come back at night to eat. If he hunts during the day, we'll come back at night. Daniel Padilla: With your knowledge of the field, what other type of animal could be responsible for cattle attacks. Is there any other animal? Nicanor Gonzalez: No, here in this area there is nothing else known. Just pumas. No,no. There is no other known animal.